Mr. Vaughan Bell's post  on November 19, 2014 carried this fascinating title that brings to the fore the fate of the autopsy specimens collected by Dr. Harvey Cushing and Dr. Louise Eisenhardt. Whilst the collection deserves recognition in its own right, its fate sounds a warning signal for all those in charge of pathological specimens collected over decades or centuries. If care is not exercised, the labors of renowned and hard-working predecessors may come to naught as what should rightly be regarded as historic legacies are neglected. 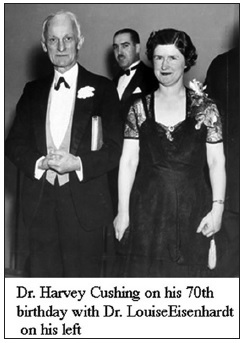 Dr. Cushing's contributions to neurosurgery have been well recorded., His preeminence in the history of this branch of surgery has been ensured for all time. His contributions – ranging from a progressive improvement in operative technique, introduction of the “ether charts” to monitor the patient's progress during anesthesia and surgery, meticulous study of a variety of diseases, one of which led to the disease of the pituitary gland named after him and carefully maintained records – helped bring neurosurgery to its present respectability and safety. The meticulous examination of each pathology specimen by Halsted and Kocher made a deep impression on him. This was intensified when he visited the Hunterian Museum at the Royal College of Surgeons in London, England. His awareness of the value of specimens in glass jars in education and research was sharpened by what he saw in the massive collection amassed by John Hunter and his successors. Returning to Johns Hopkins Hospital, he continued the practice by his teachers in Baltimore and Berne, examined each excised specimen himself, and noted his findings. In 1902, the pathology department misplaced one of his specimens – a “pituitary cyst” of the size of a golf ball from Mrs. Mary Donnelly. From then onward, he retained all his specimens – tissues removed at surgery and brains examined at autopsy. Appointed Moseley Professor of Surgery of Harvard University at the Peter Bent Brigham Hospital in 1912, he set about developing neurosurgery as a discipline. From the start, he documented the clinical findings at surgery with his own illustrations of the key features. 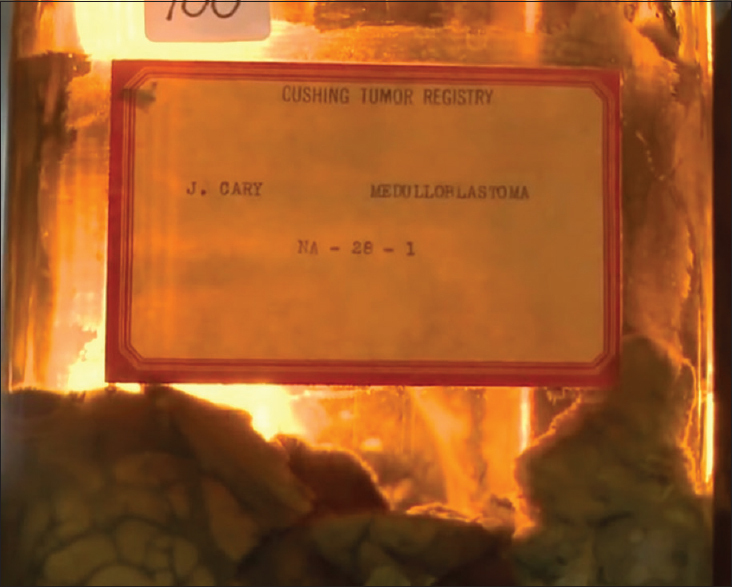 When he retired from this institution, the Cushing Brain Tumor Registry contained more than 2200 reports on patients, whole brains, excised tumors, and microscopic slides. There were also over 15,000 photographic negatives. Cushing may have intended it to serve as an archive that would perpetuate his teachings after his death. Dr. Louise Eisenhardt was the first woman to specialize in neuropathology. Her career took off when Dr. Cushing, preparing his book Tumors of the nervus acusticus, employed her as his editorial assistant in 1915. She prepared the index to this book and saw it through the press when Dr. Cushing was called upon to serve in the United State Army Base Hospital No. 5 in World War I. As her work progressed, she realized that she needed to study medicine. She graduated from Tufts Medical School in 1925 “with the highest record ever attained.” In 1922, she started bringing together all the data and specimens of intracranial tumors operated upon by Dr. Cushing. She developed supravital staining for the immediate diagnosis of intracranial tumors, using the technique originally described by Florence Sabin for the study of living blood cells., A series of publications followed – initially with Dr. Cushing and Dr. Percival Bailey and then with her as sole author. Davey  describes the close watch she kept on outcomes of surgical intervention by Dr. Cushing and how she carefully recorded them in her little black book. “Few saw and none touched the book.” Cushing's remarks on the book, made tongue-in-cheek, highlight a fundamental principle for all retrospective studies. “Never try to keep your own score if you want to be trusted by others.” He was fortunate in having Dr. Eisenhardt to keep his score. Davey also described the touching incident when soon after Dr. Zimmerman had concluded his autopsy of Dr. Cushing, Dr. Eisenhardt approached the table and without a word or undue ceremony snipped off a lock of Dr. Cushing's hair and silently vanished. He was appointed Sterling Professor of Neurology at Yale University. His ill health had made it unlikely that he could continue with neurosurgery. The Yale University web site on the Cushing Center provides a timeline on the journey of the Brain Tumor Registry [Figure 1]. Harvard had shown interest in housing the Cushing collection in its Warren Museum, but the necessary structural changes in museum were deemed too costly. A new Harvard president decided to jettison the project. In 1934, Dr. Cushing decided to move the entire collection to New Haven. Dr. Eisenhardt moved with the collection and was provided an office above Dr. Zimmerman's department. In 1938, Dr. Cushing, Dr. Percival Bailey, and Dr. Oldberg contemplated moving the collection of specimens to Chicago University where Dr. Bailey and Dr. Eisenhardt could continue to work on them. This did not work out. In 1939, after Dr. Cushing's death, the collection remained at Yale, under the care of Dr. Eisenhardt. From 1951 to 1967, items in the collection were studied by many students and neurosurgery residents. Despite her efforts, a feeling grew that the pathology specimens were occupying valuable space in the pathology department and that little use was being made of them. After the death of Dr. Eisenhardt in 1967, Dr. Elias Manuelidis became the curator of the Brain Tumour Registry, having promised Dr. Eisenhardt that the specimens and other items would be taken care of ad infinitum. The actual responsibility for this collection was handed over to his wife, Dr. Laura Manuelidis (https://medicine.yale.edu/surgery/neuropathology/cushing/). The specimens remained there, undisturbed, for many years. In 1979, the departments of neuropathology and neurosurgery were joined together under Dr. William Collins. The professor of pathology wanted all the Cushing–Eisenhardt specimens to be shifted from the Brady Museum to the subbasement of the Harkness dormitory – a physically inaccessible location. “It was considered by the Dean not to be of any value and thus no funds were provided for its upkeep” (https://medicine.yale.edu/surgery/neuropathology/cushing/). In the early 1990s, Dr. Christopher Wahl noted that medical students at Yale University would, from time to time, break into the basement and “commune with Cushing's brains.” Fascinated by the collection, he decided to write his thesis on it. He found envelopes containing 10,000 glass plate photographs alongside the specimens. 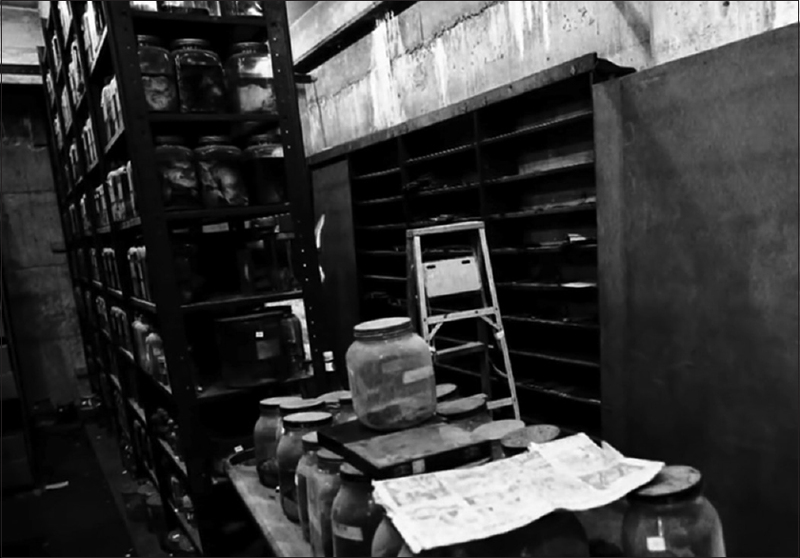 Dr. Wahl and Ms. Dagradi salvaged as many of the specimens as possible, concentrating on those with labels and in glass jars [Figure 3]. Experts at the Smithsonian Institution in Washington were consulted on the best quality of jars for preserving these specimens. The experts recommended preserving them in their original jars, made in the early 1900s, which were crystal clear and of high quality. Their suggestions were followed and the specimens remain preserved in the original jars, with the labels pasted by Dr. Cushing and Dr. Eisenhardt, often with their handwriting on them. Dr. Dennis Spencer, Chairman of the Department of Neurosurgery, Dr. Wahl, and Ms. Dagradi found space for them in a newly opened section on the lower level of the library of the medical school in 2008. Mr. Turner Brooks, an architect who teaches at Yale University, was selected to design the Cushing Center. Dagradi created the exhibitions and placement of Dr. Cushing's drawings of operation findings, sketches made during travel, books, photographs of patients made from the glass plates, specimens, and other memorabilia and, in doing so, created the Cushing Center in the Harvey Cushing/John Hay Whitney Medical Library, Yale School of Medicine that is to neuroscientists what Mecca is to the believer in the Muslim faith. Bell V. Cushing's Abandoned Brains. Available from: https://mindhacks.com/2014/11/19/cushings-abandoned-brains/. [Lase accessed on 2018 Aug 27]. Bliss M. Harvey Cushing. A Life in Surgery. Oxford: Oxford University Press; 2007. Osler W. Aequanimitas with Other Addresses to Medical Students, Nurses and Practitioners of Medicine. Philadelphia: P. Blakiston; 1932. Pandya SK, Shankar SK. Dr. Harry M. Zimmerman (1901-1995): Neuropathologist who autopsied Dr. Harvey Cushing, and his interactions with Indian colleagues. Neurol India 2017;65:948-63. Davey L. Louise Eisenhardt, M.D. :First editor of the Journal of Neurosurgery (1944-1965). J Neurosurg 1994;80:342-6. Pascual JM, Prieto R. Harvey Cushing and pituitary Case Number 3 (Mary D.): The origin of this most baffling problem in neurosurgery. Neurosurg Focus 2016;41:1-19. Fulton J. Harvey Cushing: A Biography. Springfielf, Illinois: Charles C. Thomas; 1946. Wahl CJ, Tubbs RS, Spencer DD, Cohen-Gadol AA. Harvey Cushing as a book collector, bibliophile and archivist: The precedence for the genesis of the Brain Tumor Registry. J Neurosurg 2009;111:1091-5. McMenemy WH. An appraisal of smear-diagnosis in neurosurgery. Am J Clin Pathol 1960;33:471-9. Wahl CJ. The Harvey Cushing Brain Tumor Registry: Changing scientific and philosophic paradigms and the study and preservation of archives. A thesis submitted to the Yale University School of Medicine in partial fulfilment of the requirements for the degree of Doctor of Medicine, 1996. Eisenhardt L. Diagnosis of intracranial tumors by supravital technic. Further studies. Arch Neurol Psychiatry 1932;28 :299-319. Yale University Cushing Center. Journey of the Brain Tumor Registry. 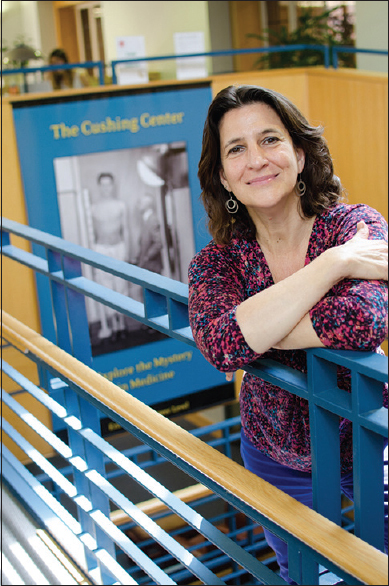 Available from: https://library.medicine.yale.edu/cushingcenter/journey. [Last accessed on 2018 Jan 31].